A second of attention taken away from the world of football and you realize that a whole week is almost gone with so much tales to tell. On Tuesday night, Petr Cech held full claims to the Golden Glove in the Premier League after Manchester United defeated Bournemouth 3-1 in a rescheduled game week 38 game. It was looking as if the Czech international will share the award with Manchester United’s De Gea but Smalling had other plans – an own goal to wrap up the wonderful 2015/16 season. Congratulations Petr Cech. An Arsenal goalie has now won the Golden Glove in two of the last three seasons of the Premier League. On Wednesday, Klopp took his Kops to Basel to face Sevilla in the UEFA Europa League Final. They started brightly with a 1-0 lead in the first half thanks to Sturridge’s 35th minute goal. But Liverpool were stunned after the break with Gameiro grabbing an equalizer within seconds. Andujar Moreno scored two goals in 6 minutes to doom Liverpool to a second Cup final loss this season. Sevilla have now won three straight Europa Leagues and will be in the Champions League next season. So we have the possibility of having 5 Spanish teams in the Champions League while Liverpool will have to stay at home and watch from their big televisions. They couldn’t even get a Thursday date in Europe. Did Zlatan say he doesn’t work on Thursday on Manchester United’s advances? Effectively, he could cut through the chaff of the middle third, bounding towards Arsenal’s attackers with the ball like a bull terrier faithfully dropping a stick at its owner’s feet. Once in the final third, Rosicky had the technical wherewithal to move the ball around the opponents’ box at speed, taking as few touches as possible. His qualities made him the ideal secondary playmaker- a vital function in any Arsene Wenger team, as we have seen this season having been forced to play without one in the pregnant pause between Cazorla’s injury and the discovery of Alex Iwobi. In the Nigeria Professional League, there were midweek games but the major talking point today is the expulsion of Giwa FC of Jos. The Jos Elephants failed to honour three games of the 2015/16 Season which warrants an expulsion. They were banished to Ilorin for 3 games but refused to play those games. Their lifeline expired on Wednesday and today the league will be finished up with 19 teams. Shame. It is just shameful to see the political gimmicks of Chris Giwa overshadowing his club Giwa FC. His battle to be the NFF committee has robbed Giwa FC the opportunity of competing in a league that they have never finished below 4th in the past two seasons. They have missed continental tickets by whiskers and now they will be thinking of life in the lower leagues by the beginning of next season. It brings to worry the possibility of private clubs surviving in the Nigeria Professional Football League. Ocean Boys were kicked out in 2012 for failing to honour games. FC IfeanyiUbah were fined for pitch encroachment and the Dr. Ifeanyi Ubah himself was cautioned. It is time to look beyond selfish gains and see what football is really meant for. There is an Oriental Derby going on in Enugu. Time to watch it. Don’t forget the cup finals across Europe including the Champions League Final. 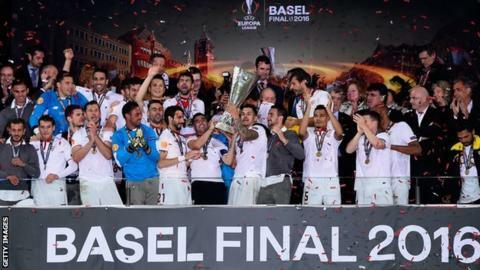 It’s sad that another Premier League season has ended but I can’t wait for next season to start.Well done to Sevilla,I think they should change the Europa League to Sevilla’s League. We have less than 90 days to the new season. Sevilla should be given a bye to the next Europa League final.